Oh Cress, how I long to have enjoyed you. Both your little sisters, Cinder and Scarlet were five star reads for me. And although you are longer, you only merit half their rating. Cress has been stuck in a satellite in orbit around earth for eight years. She is an accomplished hacker, and follows the progress of the rebels on board the Rampion ship. Her life changes drastically when the people on board contact her. Ms Meyer lost me. Cinder was a fantastic debut. It had a likeable cyborg main character, a fascinating futuristic world, and it used its fairytale roots to its maximum. Scarlet saw Cinder and Kai separated, something I didn’t like, but we got a heartbreaking plot with Scarlet and Wolf at the center instead. Cress, however, doesn’t seem to offer anything new or interesting. When we meet Cress in her satellite, I felt for her. The poor girl hasn’t had proper human contact in years, yet she’s still spunky and self-sufficient. The moment Cress gets caught up in a whirlwind of events, she loses her spark. All she does is hide behind others, afraid, and gets herself in trouble because of her naivete. We are told she’s an awesome hacker, but any hacking she does is off-page. She’s the classic bland damsel in distress that I though Ms Meyer was above of writing. I was hoping Cress could maybe become great friends with Iko or Cinder, but she never does. My biggest disappointment was the plot. Cress hinges on a first, pivotal action, which was terribly executed. Let’s just say that two main characters act as if they only have one single brain cell in their heads, causing trouble that takes longer than this book to fix. I was expecting better plotting from Ms Meyer in a third book in a series. After the starting action, the speed slows down to a crawl. There are too many points of view which have to get page time to create any sense of development. The main cast is split up for too long, and their chemistry disappears. 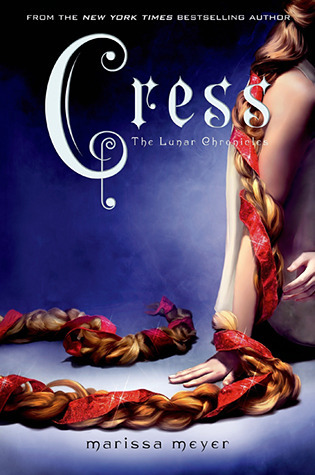 It’s clear that Cress is simply a setup for the last book in the series, Winter. I’m very worried about Winter. As it stands now, it seems to be 800 pages long – twice the length of Cinder. Since Cress already has pacing issues at 550 pages, I can’t imagine how the author is going to manage to keep the story moving for so long. Added to that is the fact that every book introduces a new romantic love interest – but unlike in romance series, there is no happily ever after at the end of the books. None of the current pairings, Cinder and Kai, Scarlet and Wolf, Cress and Thorne, are actually in a relationship. At the end of Cress one of them gets a slightly satisfying development, but on the romantic front there isn’t enough resolution, and I’m not sure how we’re going to get four couples together in one book. I loved Cinder. Scarlet was great. But Cress was a slog and single-handedly put me into a reading slump. It does have its good moments, but they’re few and far in between.